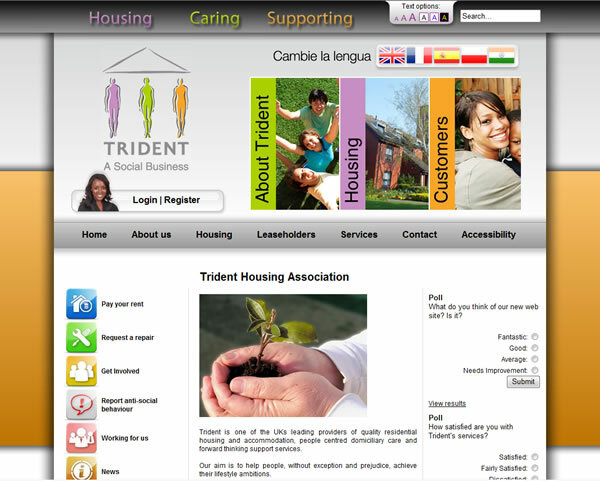 Trident Housing association are a medium sized housing association based in central Birmingham. As you would expect their tenants are incredibly diverse and this made usability and accessibility a central issue. The visitor’s were divided into ‘Existing Tenants’ (the largest group), ‘Prospective Tenants’ and ‘General Information Seekers’. I designed an animated primary navigation device that communicated that the site was divided into these sections to funnel site users as appropriate. A secondary navigation device was designed to provide fast access to the most frequent functions. We went a bit to town on the accessibility with this site and held a number of focus groups as well as consulting with the dislexia association. We decided that the standard two or three stylesheet approach was just not good enough so we created a system that separated the various content types – background, foreground, links and images – and allowed each to be customised. This customisation was of course remembered for next time. The site also supported Browse Aloud. The other side to accessibility in this system was the fact that many of the tenants spoke very poor English. So in the spirit of accessibility we decided that a dyslexic Chinese speaker should have equal access to the content as an English speaker with no impairments. We built a multi-lingual framework into the system CMS that used Google Translate to automatically translate content which could then be proof read by a professional translator saving considerable cost. At launch we had 103 pages in 53 languages which would clearly have been a mammoth task to generate any other way. This site won an Interactive Media Award and a Web Design Association Award for excellence.